Can you imagine if Flipping Physics were more accessible planet wide? 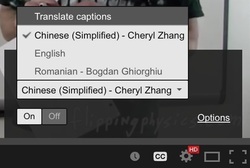 By transcribing the closed captions, you can make it possible. It is a great way to help out Flipping Physics and doesn't cost you a cent! If you are a student in a world language class, ask your teacher if you can translate one for an assignment in that class; kill two birds with one stone. If you are a teacher in a world language class, offer it as an assignment option. If you happen to be multilingual and also a Flipping Physics fan, think about how many people you can help to learn physics! To be clear here, the Flipping Physics videos are the ones we should translate, not the in-class lectures. Imagine how awesome "Volunteer Translator for Flipping Physics" would look on your resume! Also, if anyone would be interested in helping to transcribe the English subtitles, please let me know. I have a small team of volunteers who do that work for me, which is awesome! You can see their work here in this Google Sheet. Thank you so much to all of my Flipping Physics Translators!